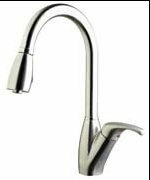 This stylish pull out spray tap measures 66.5 x 34.6 x 7.6 cm. It has a matt brushed steel finish and solid stainless steel body. It works most effectively with 1.0 bar water pressure. Having this pull out spray tap not only enhances your kitchen because of its great sleek design and luxurious finish but because it is so practical – the flexible hose allows good access to the kitchen sink area so that it can be kept thoroughly clean and therefore is great for kitchen hygiene and it also makes jobs such as vegetable preparation and washing dishes much easier as well as more efficient.